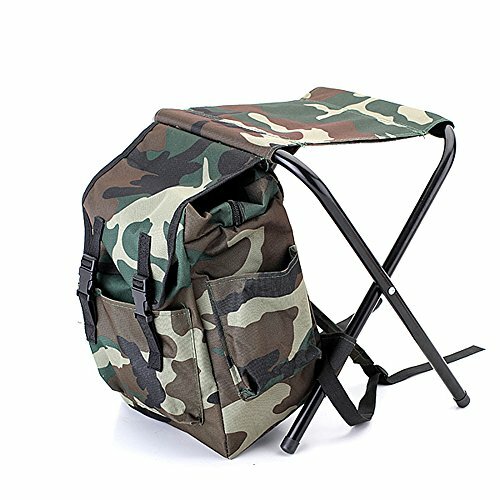 This is a collapsible chair with camouflage style.It folds up nicely when not in use and so compact it can be tossed in the trunk without taking up a lot of room, so you won't be weighed down. It is a practical tool for camping, fishing, picnics or other outdoor activities. Multiple pockets design, huge capacity, can keep your umbrella, water bottle, magazine, wallet, phone and snacks organized. With insulated cooler Bag for food storage, you can enjoy fresh food after a short trip, giving your best service, just like stay at home. I wouldn't go so far as to say the design is "stylish," but it certainly is functional and it is ideal for camping, fishing, picnics or other outdoor activities. High-intensity steel tube can hold weight up to 200 lbs. Made of high quality 600DPVC, durable, waterproof and breatheable. Easy to set up, not much space to take, portable handy. But it may a little small for the person with a lot fatness. If you have any questions about this product by Tinghan, contact us by completing and submitting the form below. If you are looking for a specif part number, please include it with your message.